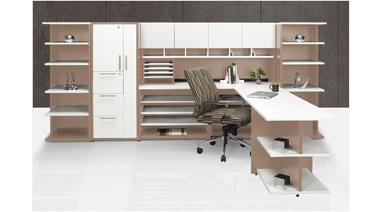 Choose this pre-configured grouping or have a unit designed specifically for your space. Available in a multitude of colour combinations. Contact your furniture specialist to discuss your options. 72"W x 96"D x 65"H. Includes worksurface, credenza, shelf, hutch with organizer shelf, hutch door kit, paper manager and square book shelf. Single Person Workstation. True White/Chocolate Walnut.